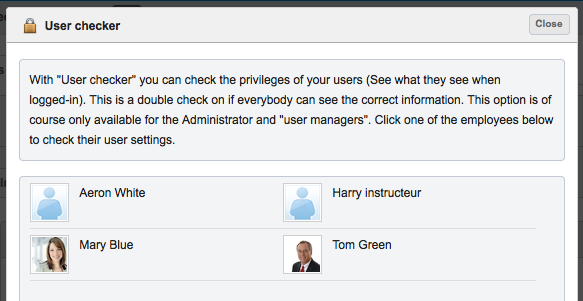 Managing the privileges of a user can be done in the HR module. 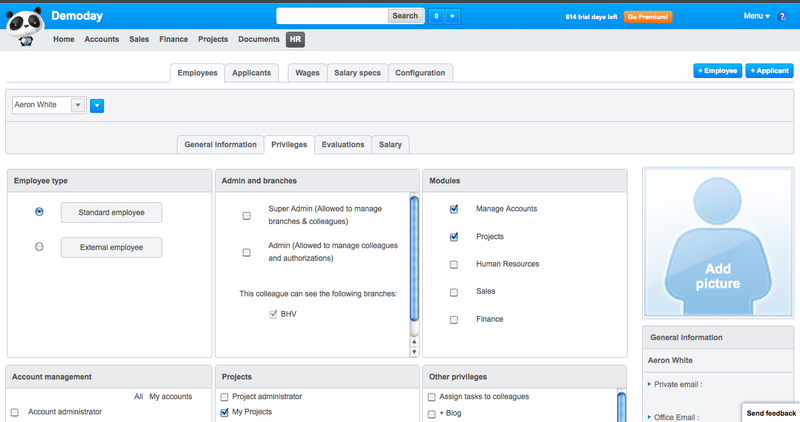 In the employee overview you have your colleagues and for each one of them you can set their privileges. You can click on the name of an employee and go to that persons profile. In the profile page you can find various options (tabs). 1 tab for general information another for Privileges, another for evaluations and yet another for Salary. After clicking on the privileges tab you will enter in the following screen where you can start to set the privileges of the employee. The first option you have is to set the employee type. In general it will be a standard employee. Standard employees can see eachother in the colleague list, can share notes with eachother, and can see eachother in the employee list for calendar invitations. The External employee cannot see the other colleagues except for the admin and other admins in the company. This privilege is specifically added for the scenario that you have freelancers working on projects with you. The Admin and branches option allows you to immediately give an employee all the rights in the system. The only difference is that the Super admin can also manage branches (subsidiaries). The normal admin can only manage everything for the branch that is assigned to that admin. In the Module selection field you can select which main modules the employee is allowed to see. There are 5 choices. The accounts module, the projects module, the HR module, the Sales module and the financial module. The moment a ny of these modules is chosen you will see that a new box opens in the bottom of the page where you can set the specific privileges for that module. 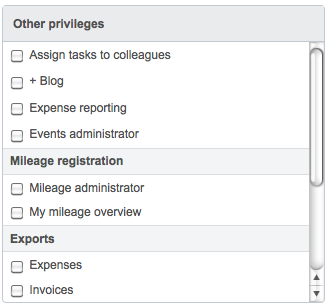 Below you can see an example of the detailed privileges of the Accounts module. This person can see Customers, Prospects and Suppliers. But only the accounts of these types for which he/she is set as the account manager. 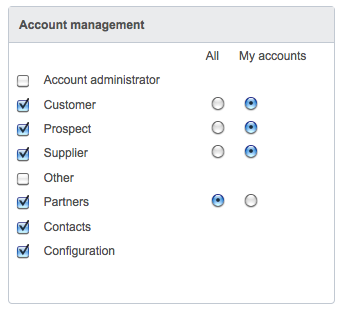 Then for Partners, this person can see all partners regardless of being accountmanager or not. Just as in the above example you can set many privileges for your employees. There are also some more general privileges. For example. You do not want your employee to manage any financial records, but you like the employee to report his own expenses. These expenses can be reported by the employee and the admin or financial manager can approve or decline these and reimburse the expenses made by the employee. 2. + Blog: The employee is allowed to see the Blog module and can help on writing blogs for your company. It is handy to have multiple people involved for proofreading and blog publishing. 3. Expense reporting: As described before. Employees cannot see anything else in the financial module, but are allowed to report their own expenses and see those back in a list with status approved or not approved. 4. My Mileage overview: Employees can record the mileages/kilometers they have driven by car. In many companies (especially consulting companies) these KM's can be charged to a customer. 5. Exports: In general it is not possible for normal employees to make any exports. Therefore you can select here which export they are allowed to make. For each privilege you can read a short description when you hold your mouse over the privilege name. It should be easy enough to create the perfect profile for any of your colleagues. To make it even more controllable and transparent we have launched the "user checker" before. After setting the privileges, you might still want to check if you have not made any mistakes. Go to the user checker (Menu / user checker / select the employee) to login in the users account and check if everything is set as you wanted it to be. This should get you started with setting the privileges for your employees. If you have any more questions, please contact us at support@mycosuite.com.